STAFF and pupils at Fearns bid a fond farewell to Lesley Roberts who retired after working for the school for 34-and-a-half years. 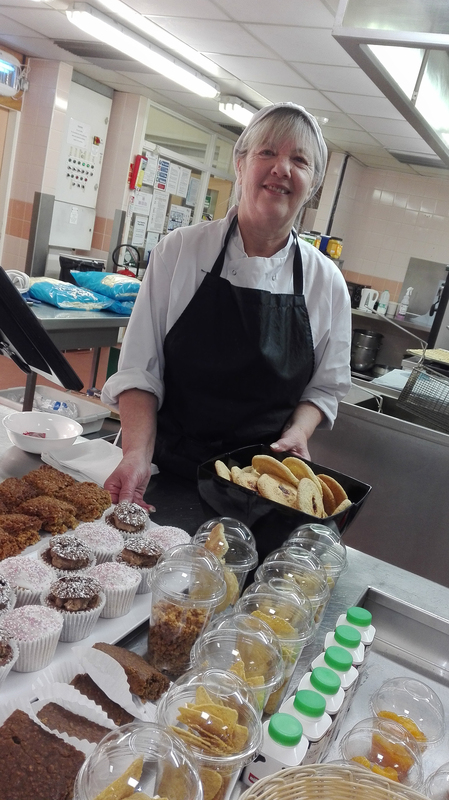 Lesley started work initially in the kitchens in 1984 and from 1995 she has also been cleaning the school. She said: “I have seen a lot of changes over the years. When I first started we had to do everything from scratch in the kitchen, from peeling potatoes to grating huge blocks of cheese. Now a lot of that preparation work is done for you. “The types of food we serve has also changed and now we do a lot more curry and more modern food, however they still get a roast dinner once a week by choice, we also do pizzas and garlic breads and Friday is always chip day. Lesley, 65, from Waterfoot, looks after her elderly parents and her daughter and grandchildren live in Dubai and she is planning to visit during school time.